A perfect hideaway awaits, where you can travel back in time, and delight in old world hospitality. The Dröm Sött Inn provides a special place to REST, REFRESH, REFUEL and RECREATE. You deserve this: no more just getting through your week, no more Netflix binges and no more of the same predictable rut. You deserve a break, an oasis from the mundane routine of daily life. Reserve a room today so we can pamper you. 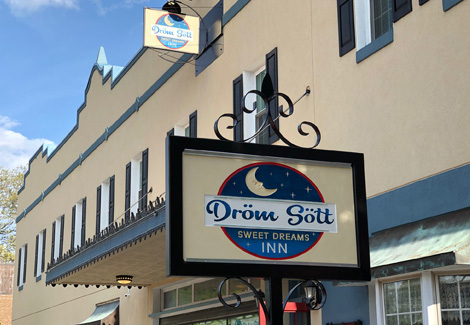 We would love to welcome you to the Dröm Sött Sweet Dreams Inn, a charming 18 room bed and breakfast nestled in the heart of Lindsborg, Kansas, a quaint little town known for its rich Swedish heritage, local artisans and annual festivals. The newly renovated inn celebrates fresh modern conveniences with nostalgic interiors, and greets each new day with a beautiful and delicious breakfast. The Inn is located just off Main Street; within walking distance of local eateries, gift shops and the town convention center. From retreats, reunions, business conferences to unique getaways, our customized hospitality can tailor a package just for you. Our innovative guest itineraries are designed to inspire and delight. Whether you love to shop, explore art galleries, investigate historical sites or enjoy an active lifestyle, we’ve intentionally planned something just for you. Our resident innkeeper is dedicated to every detail of your visit. From a warm welcome to the final sendoff, we insure each guest experiences the warm and friendly hospitality the Inn is known for. Come enjoy a reprieve from all that life demands. Unplug from the real world; rest, refresh and refuel at the all new Dröm Sött Inn.